Well happy Christmas everybody. And here to cheer you on your way are live recordings of Magpie Lane singing three Christmas carols with Oxfordshire connections. Thomas Eynstone was an agricultural labourer from Cothill – just West of Abingdon – which has actually been in Oxfordshire since 1974. His manuscript book contains over 175 religious pieces – metrical psalms, anthems, and three pieces entitled ‘Hymn for Christmas Day’, one of which (No. 25) is Joseph Stephenson’s well-known ‘Hark, Hark What News’. This piece is No. 26, and it was completely new to me at the time. Subsequently, however, I found that the New Oxford Book of Carols also had a version, taken from A Book of Psalmody, published by Matthew Wilkins of Great Milton in Oxfordshire c.1760. Apart from the fact that the words were set to music twice by the American composer, William Billings, the NOBC editors had very little information on the piece. In Dave Townsend’s recently published Oxfordshire Carols he has transcribed ‘Hark, Hear You Not’ from A Collection of Church Musick, published by Elizabeth Wilkins, c.1775 – this would appear to be either Matthew Wilkins’ widow, or his daughter (they were both called Elizabeth). Dave doesn’t have anything to add on the provenance of the piece, but notes that it has now been found in another Oxfordshire West Gallery manuscript, belonging to Richard Herring of Marsh Gibbon. Googling “Hark! Hear You Not A Cheerful Noise?” yesterday afternoon, however, I came across a YouTube “video” where someone had uploaded the recording of the hymn from our CD Knock At The Knocker, Ring At The Bell. Putting to one side the fact that this breaks various copyrights (and no, adding a disclaimer “This video is for entertainment purposes only. I do not own the copyright for the music or image used in this video” does not get you off the hook) there was an intriguing note that it was “Written by English composer William Knapp (1698-1768) in 1744, appearing in the musical work entitled “Anthems for Christmas Day””. My first reaction was “No, that’s wrong”; but further Googling revealed that it does indeed appear to be the case. Francis Roads has compiled a list of Knapp’s works which shows that ‘Hark! Hear you not a chearful noise? 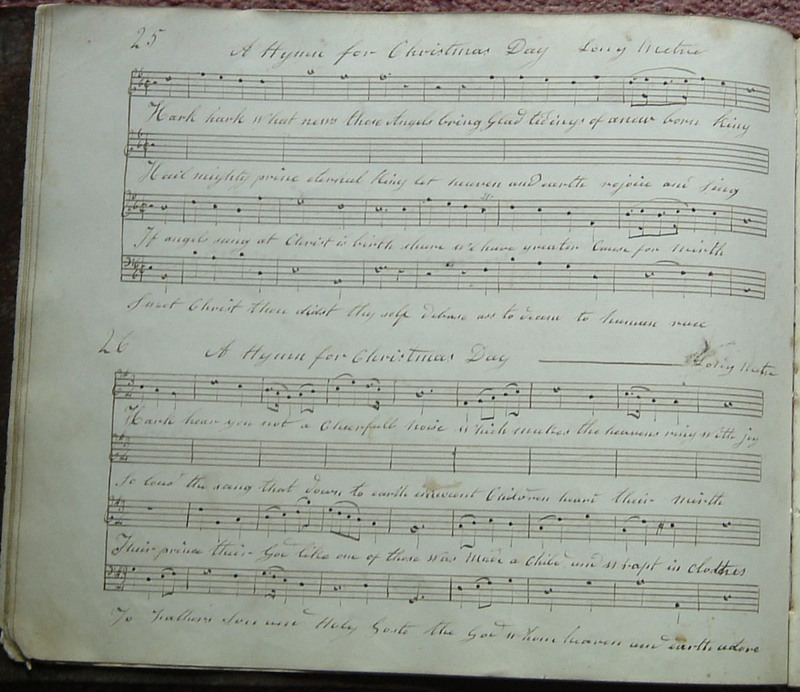 An hymn for Christmas Day’ appeared in Knapp’s Anthems for Christmas Day (London 1744). Now the Christminster Singers are very big on Dorset composer William Knapp – indeed we recorded an entire CD of his compositions. It would appear that recently, and not for the first time, we have been singing and enjoying one of his works without realising that he was the composer. Of course copyright law was not very fully developed in the eighteenth century, and Matthew Wilkins, like other publishers of “West Gallery” collections, seems to have had no qualms about reproducing works by composers such as Knapp in his printed books. You can hear a MIDI version of William Knapp’s setting at www.rodingmusic.co.uk/downloads/mus32/317/RM317.htm (you’ll need the free Sibelius Scorch plug-in to play it). 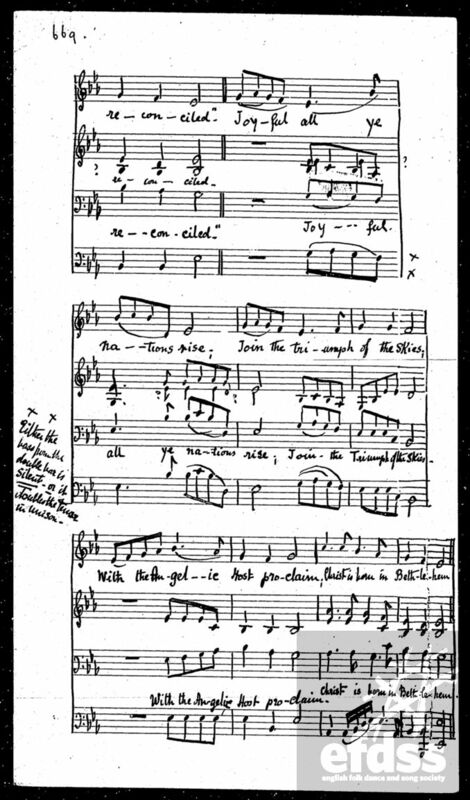 The Knapp, Wilkins and Eynstone versions are very similar: but the first two have four harmony parts while Thomas Eynstone’s has only three, and the parts are all subtly different; it looks to me as though the carol may have been passed via the oral tradition, rather than simply copied from book to book. 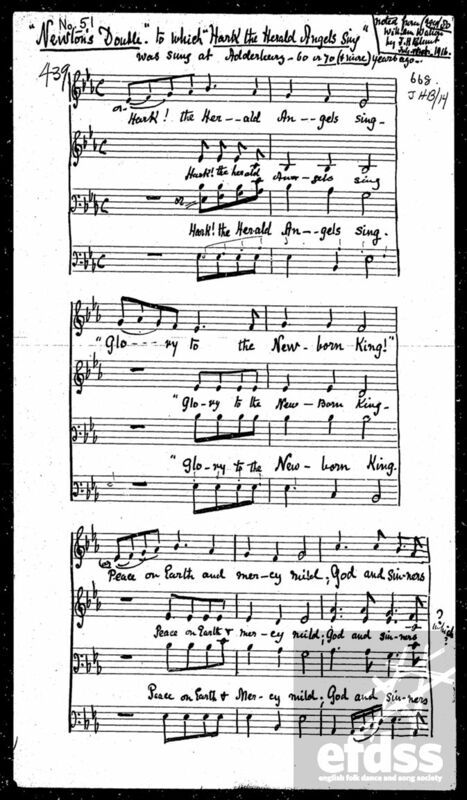 Hymn for Christmas Day, Nos 25 and 26, from Thomas Eynstone’s MS. The other two pieces here are taken directly from Dave Townsend’s Oxfordshire Carols, although Ian and I have been singing both for a while, either with the Christminster Singers, or as guest vocalists with the Mellstock Band. ‘Sellwood Mollineux’s Carol’ is a bit of an oddity, not least because it is in 5/4. Now there are numerous examples of English folk carols which are wholly or partly in 5/4, but I can’t think of another example from the West Gallery canon. Indeed, in Matthew Wilkins’ A Book of Psalmody, from which this is taken, it is barred in common time – but, as Dave realised when transcribing the piece, it is quite clearly supposed to be in five-time. Wilkins has it as a setting for Psalm 145, “I will extol you, my God and King, and bless your name for ever and ever”. But there is a copy of the Wilkins book which is inscribed “Sellwood Mollineux 1775”, and in that copy this piece is marked “Carol tune”. In the absence of any other information, Dave decided to use the tune as a setting for Philip Doddridge’s text ‘Hark, The Glad Sound! The Saviour Comes!’. The Mollineux family, incidentally, were farmers in the Great Milton area; Sellwood is, I think, an unjustly neglected first name, due for a revival (although I wouldn’t necessarily wish it on any of my own children!). Finally, ‘Newton’s Double’, from William Walton of Adderbury. In the 1910s Walton provided local folk-song collector Janet Blunt with numerous songs, information about the Adderbury Morris, and West Gallery style carols. He had sung the old carols, first as a boy, then as a man; and remarkably could recall all of the harmony parts from his youth. Blunt had trouble working out how the parts of this fuguing piece fitted together, but Dave Townsend has reconstructed it with reference to other sources, in particular the 1836 James Martin MS from Poole. Hark! The Herald Angels Sing (Newton’s Double), collected by William Walton of Adderbury by Janet Blunt; from the Full English archive. The recordings of ‘Sellwood Mollineux’ Carol’ and ‘Newton’s Double’ were made at this year’s annual Magpie Lane Christmas concert in the Holywell Music Room, Oxford. We were joined for these by our friends from Eynsham, Tom Hillman, Toby Goss and Simon Headford. Many thanks to them and, of course, to Dave Townsend for making us aware of these fine carols. Magpie Lane, recorded at the Holywell Music Room, Oxford, 14th December 2013.